In Houston, Texas, community members hosted a march Saturday in memory of Deputy Darren Goforth, who was gunned down at a gas station last month. Marchers wore blue shirts and carried a banner that read, “Police Lives Matter” and “Undivided We March” with Goforth’s image on the front. Goforth, 47, was in uniform when he was killed while putting fuel in his patrol car. A 30-year-old Houston man is charged with capital murder. Investigators are still trying to determine a motive. The killing brought out strong emotions in the law enforcement community, with Harris County Sheriff Ron Hickman suggesting that it could have been influenced by heightened national tension over the treatment of blacks by police. 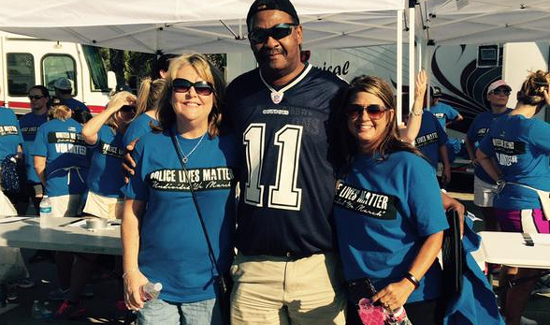 Goforth was white and the man charged with killing him, Shannon Miles, is black.